Tiller North. Rosa Lane. Sixteen Rivers Press. San Francisco, California. 2016. 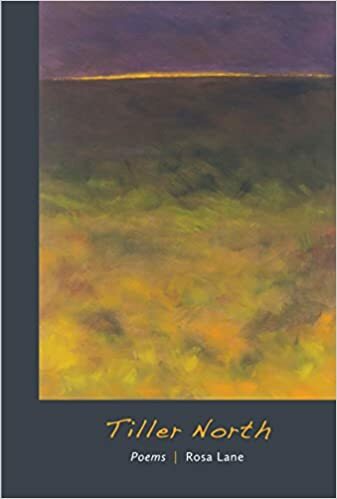 Rosa Lane's Tiller North makes Today's book of poetry think of Alistair MacLeod's short stories in marvels such as The Lost Salt Gift of Blood and As Birds Bring Forth the Sun and Other Stories if they were written by a woman of equal power and persuasive gifts. Or Michael Crummey's stunning novel Sweetland. These poems feel like they are familiar, like they take place on or near the same water. Today's book of poetry says this because these poems are big, they feel like stories, fill up the space and imagination just like a big novel. These poems situate you in a rural/remote fishing community surrounded by sea and brush. You are in the kerosene lit kitchen, you are in that death-watch bedroom. But most certainly, you are there. The natural path Rosa Lane pushes you down in these poems is strewn with hard work and calloused hands, hard living and some hard luck. Yet there doesn't seem to be much complaint, this is reportage using memory rendered poetic. Lane isn't asking for any empathy, her heart is full to bursting with memory. and I will be hers in less than a year. with hand-pumped water drawn from the well. planted in the deep crevice between them. Lane takes the reader to a time and a specific place in these poems. We'll never truly understand the life of a small and remote fishing village but we certainly understand more now. We can't smell the kerosene or the fish but Lane gets us there, we are on the coast of Maine gazing west towards civilization. Today's book of poetry was terribly enamoured reading Tiller North, Rose Lane has that steady Andrew Wyeth gaze and hand, and it would appear some of his same ideas about story, narrative and how to make the heart arc. Many of Wyeth's paintings seem stark but in fact they never are, Rosa Lane has that trick finessed. There are some hard moments in Tiller North but a warm and tempered heart is leading the way. Tiller North is coming of age poetry writ large over the working class background of a young woman in a remote place. arched glass stained with light on the hill. white wafers of a single mind. run to the school bus each morning. of the harbor we are damned to leave. No guests for this morning's read as Ottawa was covered in snow this morning. A number of our staff didn't make it to our digs on Dagmar. I was out shovelling snow for over an hour earlier this morning and will go back out when it stops snowing altogether. Milo, our head tech, and Kathryn, our Jr. Editor, both made it through the snow, they live close by and walked. The three of us batted these poems around until we reached shore. Today's book of poetry really liked the tone Lane establishes from the start, she has such confidence and is so self-assured that you feel like some of it might rub off, a little osmosis through hard living. burns a small hole at the door. on a horse she never sees. Rosa Lane's Tiller North is the 37th title from San Francisco's Sixteen Rivers Press. Lane joins a fraternity that includes Nina Lindsay, Stella Beratlis, Ito Naga and Beverly Burch, very fine company. Today's book of poetry thinks you should join Rosa Lane on her journey back to the Maine of her youth. Lane's Tiller North imparts a portrait of family and community, loss and found, in one elegant nostalgic yawp. ROSA LANE is a native of coastal Maine, with familial and ancestral roots steeped in lobster fishing. She earned her MFA from Sarah Lawrence College and is the author of the poetry chapbook Roots and Reckonings(Granite Press, East, 1980). Her work has appeared in numerous journals, including The Briar Cliff Review, Crab Orchard Review, New South, and Ploughshares. After earning her second master’s and a Ph.D. in sustainable architecture from UC Berkeley, Lane works as an architect and divides her time between coastal Maine and the San Francisco Bay Area, where she lives with her partner.